After the Japan attacked Pearl Harbor in 1941 and the U.S. officially entered World War II, all men between the ages 18 and 45 were required to enlist in the military while all men between 18 and 65 had to register. From 1940 to 1947, over 10 million men were inducted, which left a huge gap in the work force during the war years. With so many of our “boys” fighting overseas, who would build the tanks, bombs and planes needed to win the war? The song “Rosie the Riveter” became the anthem of a generation and part of a campaign that prompted women from all across America to show their patriotism by doing what most women of that era never dreamed of—working at jobs that required them to hammer, weld and build military machinery on the assembly line. The song encouraged American women to “[make] history and [work] for victory” – just like Rosie. Eventually, the icon became the symbol for America’s proud new female workforce. The famous Saturday Evening Post cover by Norman Rockwell was based on the real-life nineteen-year old Mary Doyle Keefe, a phone operator from Arlington, Vermont. In reality, Keefe was a petite woman, a far cry from the stout figure in Rockwell’s painting. Rockwell took more than a few liberties with his model and created a somewhat androgynous figure in overalls holding a heavy riveting gun in one hand, a ham sandwich in the other and resting her foot on Hitler’s book Mein Kampf. The poster traveled the country along with Rockwell’s Four Freedoms as part of a fund-raising effort for the war. Keefe wasn’t bothered by Rockwell’s interpretation of her. In fact, in a 2013 article for Saturday Evening Post she said she was pleased that the piece raised money for the war effort. “I am proud of this painting. It’s a symbol of what the women did for the war, to do their part, and to give up their nail polish,” Keefe added. 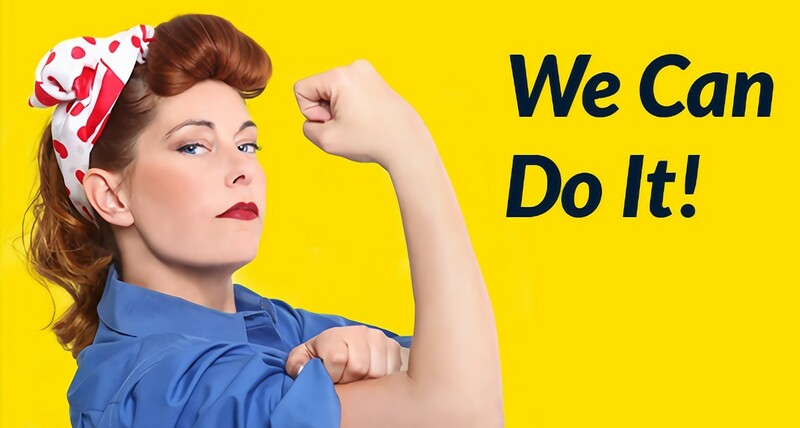 Many people mistake another iconic poster, the one showing a kerchiefed woman flexing her muscles with the title “We Can Do It,” as Rosie. According to The Pop History Dig this work of art J.Howard Miller was also used to promote patriotism, but the figure wasn’t nicknamed Rosie until it became popular again in the 1980’s. Miller’s model was primarily based on a factory worker named Geraldine Doyle. Of course, riveting wasn’t the only job women were needed for during World War II. “Wendy the Welder” and “Mrs. Casey Jones,” are just two of the other lesser-known propaganda characters that came to represent the female workforce in all. The 1940’s may have been the era that led to “sisters doing it for themselves,” but it all started because Rosie and her “sisters” were willing to step outside their comfort zones and serve their country. Welding training, railroad engineering, riveting and punching the time clock in offices and factories across the nation became a normal part of life for women during and after the war. Rosie the Riveter not only helped the U.S. win World War II, she changed the landscape of the American workplace forever. While women are still a minority in the blue-collar sectors, their number is steadily rising.